The CE National, the Church Effectiveness organization, chooses one church in the Fellowship of Grace Brethren Churches that it considers worthy of the honor of Church of the Year. Grace Community Church in Goshen, Ind., is this year’s recipient. Let me tell you about your church! It is all about reaching the younger generations. AMEN. One of the best children’s ministries and youth ministries are right here. It is all about reaching the overlooked. Not only are you reaching people who live in Goshen and the neighboring communities and the homeless but orphans in Cambodia and you are training people to see these needs and to meet them. You are known in the community by your giving spirit in relation to use of your facilities, help with people and so much more. And you are seeing people come to Christ all the time.. It is all about teaching people that Jesus is worth it all and the Bible is our source of strength and we must build leadership for training. Can’t you see that through the FIGHT CLUB for men and the ways you are passionate about the Lord. God is the one who is using your leaders and your volunteers and as a result of what you are seeing God do. In 2012, you are averaging 2100 in attendance and growing weekly…. You are “catching it” since 98 children prayed to receive Christ this summer and at least 100 adults have come to faith in the last six months and you have seen youth come to Christ at Momentum and at Easter and through the FIGHT CLUB for men and more! And these new believers are being led into opportunities to grow spiritually all the time! Congratulations to you! I know it is a work of God, but humanly speaking CE National wishes to honor your church for the ways you are allowing God to use you. This honor goes to your pastors, your volunteers, and your believers. 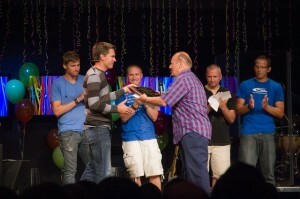 Rejoice with us as GRACE COMMUNITY CHURCH is named CHURCH OF THE YEAR! The plaque reads CE National Honors Grace Community Church, Goshen, IN. Jim Brown pastor…. Church of the Year. 2012.